Next-generation sequencing (NGS) is driving our current approaches to molecular diagnosis and characterization of inherited genetic disorders and is also enabling the discovery of genetic variants that induce susceptibility to non-inherited disorders. Advancements in NGS platforms and bioinformatics pipelines have allowed high-throughput, cost-effective, and efficient coverage of all coding regions of the genome, making whole-exome sequencing (WES) highly feasible in a clinical setting. Consequentially, the specificity and sensitivity for detecting all coding changes have tremendously improved, and the efforts and duration required to narrow down to the precise disease-associated variant(s) have significantly reduced. Rightly so, WES and whole-genome sequencing (WGS) are fast becoming the one-for-all clinical genetic tests, leading our way to precision medicine. 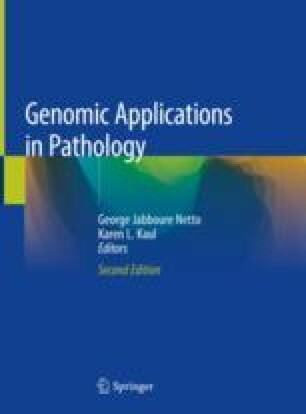 In this chapter, we summarize the evolving roles of WES, which range from its use as a disease diagnostic tool for rare single-gene Mendelian disorders to a routine screening tool for monitoring disease progression and treatment response in cancer patients, as well as a tool for novel gene discovery in a research setting. This chapter highlights the achievements and limitations of the technology and emphasizes the challenges involved in the implementation of WES assays for clinical care. Dragojlovic N, Elliott AM, Adam S, van Karnebeek C, Lehman A, Mwenifumbo JC, Nelson TN, du Souich C, Friedman JM, Lynd LD. The cost and diagnostic yield of exome sequencing for children with suspected genetic disorders: a benchmarking study. Genet Med. 2018; https://doi.org/10.1038/gim.2017.226. Parsons DW, Roy A, Yang Y, Wang T, Scollon S, Bergstrom K, Kerstein RA, Gutierrez S, Petersen AK, Bavle A, Lin FY, Lopez-Terrada DH, Monzon FA, Hicks MJ, Eldin KW, Quintanilla NM, Adesina AM, Mohila CA, Whitehead W, Jea A, Vasudevan SA, Nuchtern JG, Ramamurthy U, McGuire AL, Hilsenbeck SG, Reid JG, Muzny DM, Wheeler DA, Berg SL, Chintagumpala MM, Eng CM, Gibbs RA, Plon SE. Diagnostic yield of clinical tumor and germline whole-exome sequencing for children with solid tumors. JAMA Oncol. 2016; https://doi.org/10.1001/jamaoncol.2015.5699.